Self Love is the belief that You are a Valuable and Worthy Person . We often neglect ourselves , we are so much occupied with our daily routines that we hardly find any time to think about our inner happiness . We are not at the top of our priority list , it’s our family , then profession , social obligations that tops the priority list . We are the end of it . Infact at times we feel guilty if we think much about our happiness and choices in anything , be it be the Menu or Vacation Destination or any such thing we do what others like , What our kids want or what our spouses like , we are okay with it and feel happy to see them happy . We rarely think about what we want . Specially this is a major problem with married women , she does what her husband likes , what her kids want , next comes family , relatives and in-laws , and she tries to find happiness in that . But my point is ” There is no harm in keeping your point of view in a positive way “. Actually we underestimate ourselves , we easily accept and agree what others want , we do hesitate to tell our opinion . This leads to low self esteem , lack of confidence in any decision making and ultimately No Self Love . Yes I do feel that Women don’t love themselves the way they should . When they don’t love themselves how do they expect others to Love & Respect them . We need to love ourselves so that we feel good , and can make others feel our worth . To Love one self one does not need to be rebellious or quarrelsome . There are simple ways by which we can Love and Pamper ourselves and also make other feel our worth . I am doing this past few years . Any time when I feel like having some ME TIME , I simply leave all my work , be it be house hold chores or any professional work , I leave it and do what I want , it could be going to a near by park and sitting alone some time away from every thing , so to recharge myself or it could be going for a walk or shopping alone , it could be taking a short Nap or watching some Youtube video’s which I love to watch . This way I reward myself for all the hard work I am doing all through the day . 2. Keep reminding yourself all good qualities you have which makes you Unique . All of us are gifted with lots of good qualities by the almighty . Some are intelligent , some are creative , some are hard working . So try to realise your potential and good qualities and feel happy about it . That helps to make you love yourself more and builds up inner confidence . It’s not a crime to be open about ones likes or dislikes . If I want to eat Vegetarian , it’s not necessary that for the sake of my husband and kids I should always prepare Non-Vegetarian food ( this is just an example ). I cook what my family members want to eat But I eat what I want to eat , that makes me do double work but I am Okay with it . We have the right to eat what we want to eat . Similarly when any decision is made in the family regarding anything , We should be open about our views , it’s not that always others take right decision , we also give Valuable and good suggestions , so go ahead with it without thinking much . Usually after marriage and kids women gets disconnected with her friends to some extent . 5. Once in a month we can pamper ourselves by visiting a beauty parlour or spa , to relax ourselves and feel better . These simple things will not only keep us happy but also will help us to come out of our monotonous routine which is at times too boring and can help us to build confidence , which is required for Self Growth and a Healthy Life as if one is not happy from inside , he/she can’t be healthy as depression causes lots of health problems . Try to explore yourself so to know yourself better , So that we can work on our happiness and only a happy person can radiate happiness and positivity to others , a troubled and depressed soul can’t . Hope you all liked this post and found it useful , do share your views on this , would love to read your comments on this topic . I am writing this post in association with a blogger friend Zainab Raazi of blog Slim Expectations . 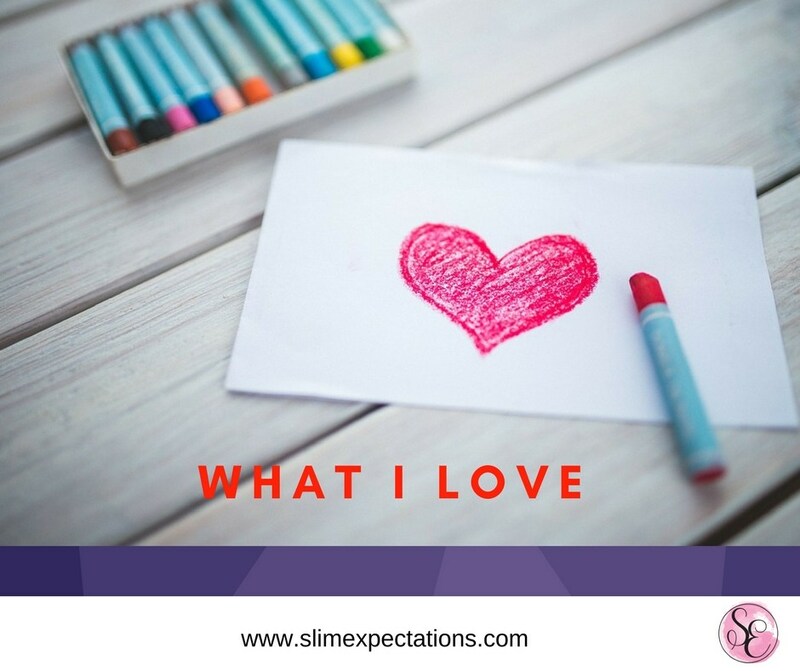 This blog post is a link up with Zainab for #WhatILove .